ProPublica reporters Jesse Eisinger and Jake Bernstein have been awarded a Pulitzer Prize for National Reporting for their stories on how some Wall Street bankers, seeking to enrich themselves at the expense of their clients and sometimes even their own firms, at first delayed but then worsened the financial crisis. We at ProPublica are delighted by this award, and deeply honored. This is ProPublica's second Pulitzer Prize in as many years. Last year, ProPublica reporter Sheri Fink won a Pulitzer for Investigative Reporting for her article "The Deadly Choices at Memorial," on euthanasia at a New Orleans hospital in the wake of Hurricane Katrina, published in partnership with The New York Times Magazine. 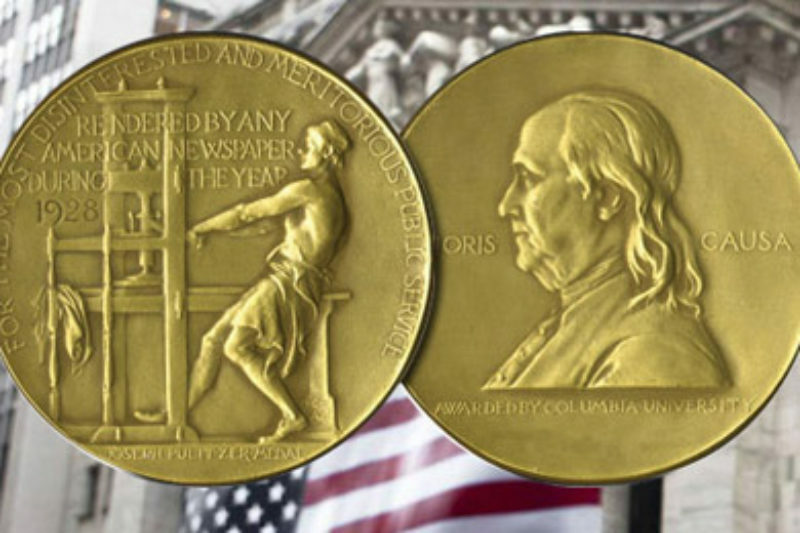 This was the first Pulitzer Prize ever awarded to an online news organization. This year's Prize is the first for a group of stories not published in print. Jesse and Jake's work was greatly augmented by partnerships with public radio's "Planet Money" and "This American Life." While radio reporting is not eligible for the Pulitzer, we want to acknowledge a great debt to, and celebrate our partnership with, Adam Davidson, Alex Blumberg and Ira Glass and their teams. I also urge you, if you haven't seen them before, to check out the two songs -- a Broadway-style parody from the team that has recently collaborated on "The Book of Mormon," and a work from the young geniuses who Auto-Tune the News -- that accompanied this series. There's also a comic strip. But while we poked fun at the ironies in this story, and by so doing tried to make it more accessible, its central point is quite serious, and critically important: that the mores of Wall Street, at least in the period 2006-2008, were not consistent with the public interest or the national interest, and that greater oversight (and perhaps enforcement actions) may be in order. Our ultimate test for our work at ProPublica is impact, and we believe this reporting has helped spur activity by the SEC and the Congress -- activity we continue to cover, as recently as twice this past week. Today's honor caps a series of awards for ProPublica this year, including two George Polk Awards, one for radio (with NPR) for our series on brain injuries to our troops, another for television (with Frontline) for our reporting on police violence in New Orleans after Katrina; a National Magazine Award finalist nod for our story on dialysis facilities; the American Society of News Editors Batten Medal for sustained reporting on the New Orleans police story; two Investigative Reporters and Editors Awards, one for the dialysis story and accompanying database, the other for innovation for our "Dollars for Docs" series; and two awards from the Society for News Design for our news applications. These awards mean a lot to our staff, especially as all of them reflect the judgment of our peers in journalism. But they are not why we are in business. Instead, as I indicated above, ProPublica was created to spur reform through journalistic means -- and to do this by reporting and writing stories with "moral force," that is, stories about abuse of power or failure to uphold the public trust. That is our mission, and today's award encourages us to continue it with increased vigor. One last point: to do this, it takes money. ProPublica is a non-profit, and contributions are tax deductible. We had more than 1300 donors last year and almost 500 so far this year. The median donation is $50, but whatever you can give will be greatly appreciated, and will truly help us make a difference. I invite you to celebrate with us by making a contribution by clicking here.